Utilities in the U.S. are moving to a cleaner, more distributed power system, Utility Dive’s sixth annual sector survey shows, but are unclear about how they will get there. 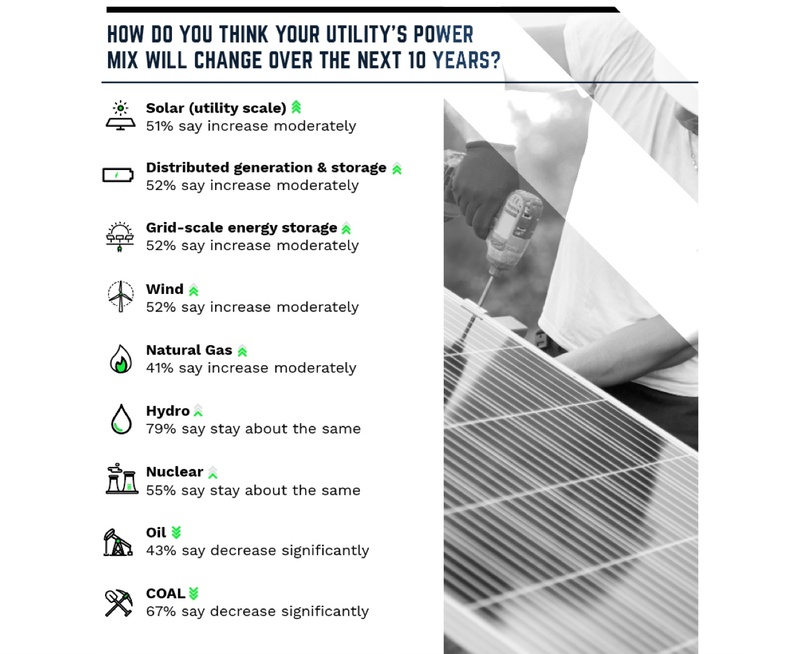 The 2019 State of the Electric Utility Survey, out today, shows that power providers are continuing their decades-long transition away from large coal generators and toward more renewables and natural gas. Full data sets for the power mix responses and other SEU questions are available in the index of the report. 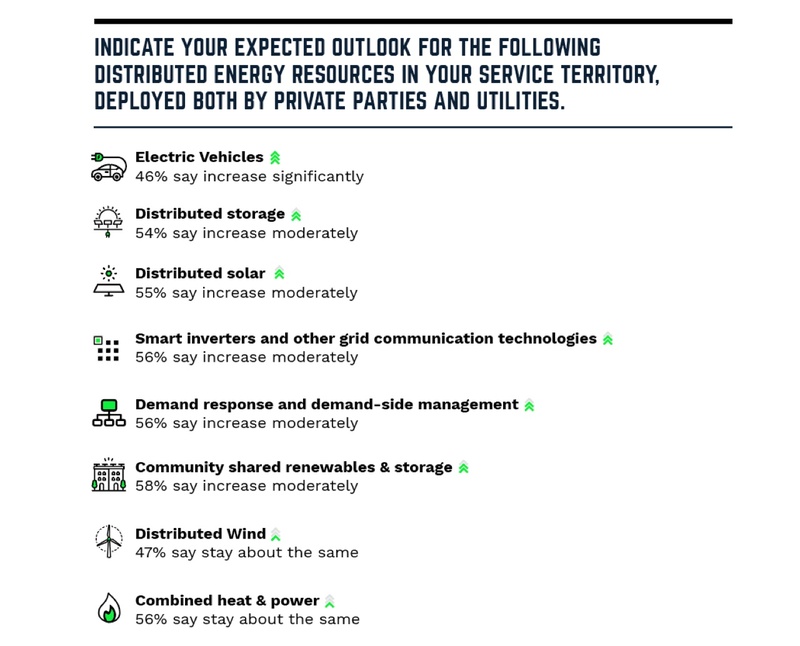 Utilities are also increasingly bullish on the growth of distributed resources, particularly electric vehicles, according to the online survey of more than 520 utility employees. Those trends have been persistent in Utility Dive surveys for years, but that continuity masks a growing anxiety in the power sector. 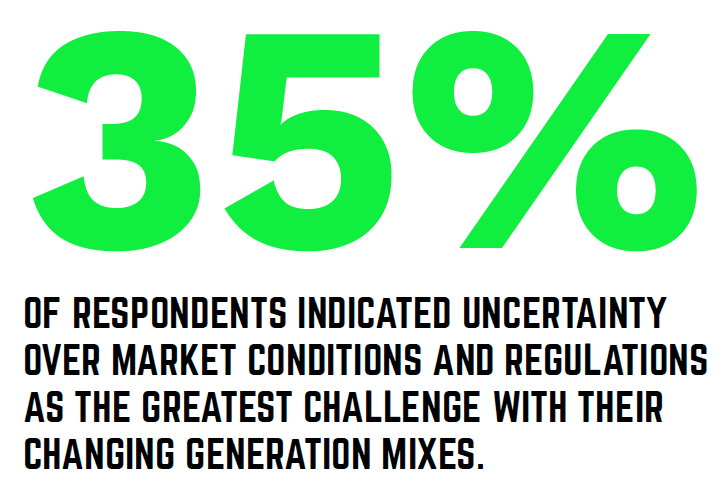 How will these utilities are increasingly unsure and conflicted about what types of regulation and market structures they want to foster this transition, and they list this uncertainty as the top concern with their changing fuel mixes. Part of this uncertainty may come from widely expected changes in utility regulatory models. 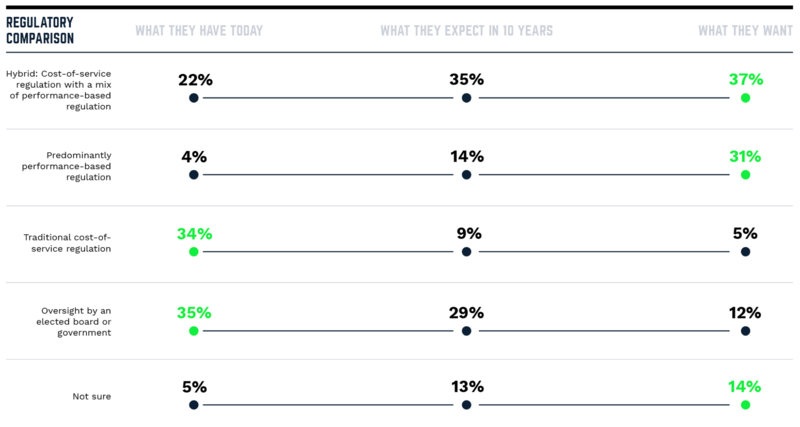 While more than a third of respondents said they operate under a traditional vertically integrated utility model today, only 5% expect that to be the case in a decade. 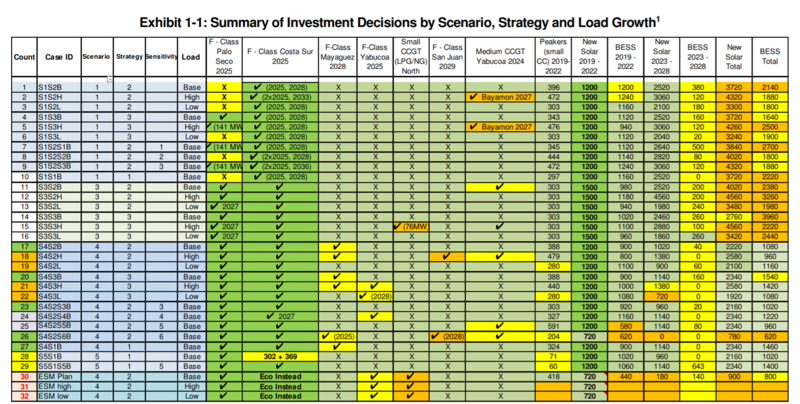 In its place, many utilities expect — and hope — to have more performance-based ratemaking. 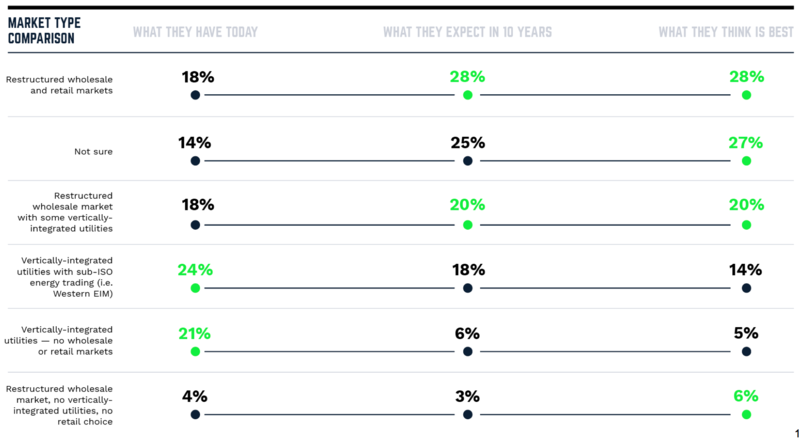 While the expectation of a move to PBR is clear among respondents, there is less agreement about what type of electricity markets will drive the transition to a cleaner power system. 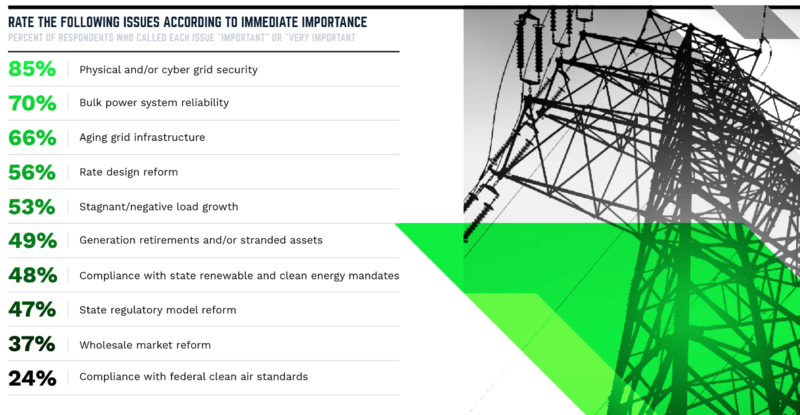 While utilities largely expect and desire a restructured market, more than a quarter are unsure of the best model. One point of near consensus in the survey was the utility sector’s antipathy toward key priorities of the Trump administration. 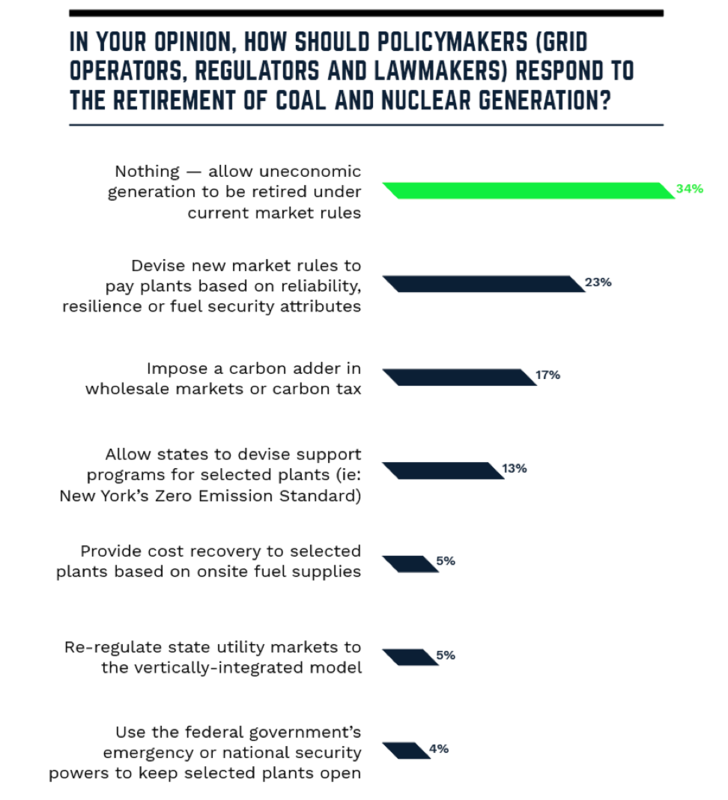 More than 80% of respondents think the federal government should regulate carbon and only 4% support a federal bailout for coal and nuclear plants. If business model pressures weren’t enough, utilities are also keenly aware they face persistent security threats. For the third year running, physical and cyber grid security topped the list of the sector’s most pressing concerns. How will utilities deal with these changes? The 73-page report gives more insight into their changing business models, outlook on distributed resources, plans for rate design and more. You can download it here for free and listen to our SEU Survey Webinar with former FERC regulator Nora Brownell and energy consultant Alison Silverstein here. A year after the administration announced solar tariffs, some plants are now opening, some are still in the works and one has been scrapped. On Tuesday, JinkoSolar will officially open its Jacksonville, Florida solar module factory. The Chinese company announced that plant in January of last year, roughly a week after the Trump administration unveiled its final tariffs on crystalline silicon solar cells and modules. It was the first of a string of such announcements as foreign manufacturers stared down the threat of trade duties, which took effect last February. It’s been months since many of those announcements became public, so Greentech Media checked in on the progress. It turns out that some manufacturing pants are online, some are still on the way and at least one plant has been scrapped. In announcing Section 201 tariffs, President Trump promised they would buoy U.S. solar manufacturing and create “lots of really great jobs with products that are going to be made in the good old USA.” So far, the results have been mixed. Though the official opening is Tuesday, Jinko began pilot production at its plant in November of last year. On the company’s third-quarter earnings call, CFO Haiyun Cao said the plant is expected to be fully ramped by early 2019. A spokesperson for Jinko confirmed that hiring was on track, with more than 100 people employed so far. The plant should ultimately reach 400 megawatts in solar module capacity and employ about 200 people. Jinko declined to comment on further manufacturing expansions in the U.S. or abroad. Hanwha Q Cells provided few details about the progress of its Whitfield County, Georgia module factory. The company did confirm that the project will be 1.7 gigawatts when fully ramped. When it announced the project, Hanwha said capacity would exceed 1.6 gigawatts and construction would be finished in 2019. John Taylor, senior vice president at LG Electronics USA, said construction of LG Solar’s Huntsville, Alabama solar module plant is almost finished. The project adds to LG’s existing operations in Huntsville, where it has had a presence for four decades. Some pilot production has already begun, with full manufacturing scheduled to commence in mid-2019. Taylor would not confirm whether that meant Q2 or Q3. Once fully ramped, the plant will have the ability to produce 500 megawatts of solar modules per year. Though Taylor said the plant is “highly automated,” LG is in the midst of hiring and expects to bring on 159 employees. LG said it has no additional plans for expansion of its solar manufacturing. A Minnesota factory built by Canadian firm Heliene was the first foreign-owned manufacturing plant to begin rolling modules off the line post-tariff announcement. Production began in the last week of August, and the plant is now fully ramped to its 140-megawatt capacity. Ahead of production, Heliene said the plant would create 130 jobs in the state’s Iron Range region. So far there are only 97 employed at the plant, but President Martin Pochtaruk said that number will increase when a fourth crew starts working weekends in May. As the Minnesota operations grow, Pochtaruk said Heliene’s Canadian manufacturing has declined; its Canadian plant is operating at half its 250-megawatt capacity. “We went from having four crews and working 24/7 to having only two crews working four days a week,” said Pochtaruk. Most of the product from Canada, 75 to 80 percent, goes to the U.S., meaning the company is still paying tariffs on a chunk of its modules. Back in the summer, Heliene had plans to take over another 75-megawatt manufacturing plant in Oregon, formerly owned by Suniva. Pochtaruk said the company canned the project this fall because it determined operational costs were too high. Heliene doesn’t have any other current plans for more manufacturing capacity. A recent financial filing showed just how much SunPower paid for the assets of SolarWorld Americas: $30.1 million. The California-based company bought the bankrupt SolarWorld along with its Hillsboro, Oregon manufacturing plant in a possible bid to garner enough favor with the administration to gain a tariff exemption. In September, SunPower got it, allowing the company to save up to $2 million a week in tariffs. Now the company is moving ahead with its plans to manufacture in the U.S. CEO Tom Werner said the company moved equipment in November and December and produced its first module in Oregon before Christmas. The CEO said the plant will ramp to full production in the next few months, and SunPower will ship its first product out of Hillsboro before March 1. According to Werner, discussions for those partnerships are still in preliminary stages. Silfab, a Canadian-based manufacturer, bought a Washington plant from Bellingham-based manufacturer Itek in August. The company is now in the process of doubling capacity there, to about 300 megawatts. Geoff Atkins, an executive adviser to Silfab, said modules will roll off the expanded line in early April, but Silfab has been running the plant since it took over in October as it builds out more capacity. “We’ve actually divided the building in half while we add the second line,” Atkins said. Through automation, modifications and upgrades on existing equipment, he added that Silfab has doubled the number of modules it’s able to push out of the existing line, up to 1,500 per day. Silfab said it worked to keep Itek’s employees, training them in any changes made during the updates. The plant continues to employ between 80 and 90 employees and Atkins expects that number to grow to approximately 120 when the second line goes into operation. While Atkins said Silfab is “100 percent committed to the North American market and North American manufacturing,” he expressed skepticism about peers in the industry who he feels are dragging their feet on shipping made-in-the-U.S. products. Silfab has another expansion coming soon, slated for the middle of 2019. The equipment has already been ordered, according to Atkins, and now the company is choosing whether to expand in Bellingham, elsewhere in the U.S. or at its Canadian site. The company wants a location close to both labor and ports so they can deliver product quickly. Sunpreme, a bifacial solar company that in September confirmed plans to open a Texas-based facility, did not respond to requests for comment on that project’s progress by the time of publication. When the plant was announced, the company targeted production in 2019. Taiwan-based United Renewable Energy Company, a union of Neo Solar Power Corporation, Gintech Energy Corporation and Solartech Energy Corporation, was also reportedly mulling a U.S. manufacturing site in January 2018. The company did not immediately respond to request for comment. Construction is about halfway complete at First Solar’s 1.2-gigawatt Ohio plant, which will produce the company’s tariff-exempt Series 6 modules. According to a spokesperson, construction on the shell of the facility is complete. Production tools will move into the building in the third or fourth quarter of 2019. Full production should kick off in Q1 2020, slightly after FirstSolar’s April announcement that targeted production in late 2019. As those plans chug toward completion, some companies have also blamed tariffs for cutting down manufacturing in the U.S.
REC Silicon has been hanging on for months amid dwindling profits tied to Chinese tariffs on polysilicon. The company announced this month its Moses Lake, Washington plant would shut down. Francine Sullivan, REC’s vice president of business development, said the company believes the shutdown is only temporary. Though polysilicon tariffs are not specifically tied to the Section 201 tariffs, the company had worked with the administration to resolve all solar-related tariffs together. Since 2014, U.S. polysilicon manufacturers have been hard hit by duties from China, a significant market. Sullivan said REC remains hopeful the administration will work toward a resolution. It’s been 20 years since the first retail power markets opened under deregulation, allowing consumers in those markets to choose their energy supplier. What effect has that had on U.S. retail energy markets through today? Direct Energy Business President John Schultz recently offered an update. As it currently stands, the scorecard on retail markets is mixed. Some states are focusing on how competition impacts low income and vulnerable homeowners. “They want to make sure those individuals are truly benefiting from competition and that the propositions and products are offering them something that’s differentiated from the utility,” Schultz remarks. “As well as they’re looking at industry sales practices and making sure those meet standards. Both of those are things Direct Energy supports and are actively participating in dialoguing many of those states.” Direct Energy Business President John Schultz gives his insights on the U.S. energy market, key energy management strategies and new innovations coming in 2019. On the business side, the scorecard is a bit clearer. In fact, there is almost universal agreement that businesses are benefiting from the competition. In states with retail energy competition, businesses are participating at a rate of almost 80 percent. Purchasing energy from a retail supplier is helping organizations manage their budgets and insulate from market volatility. Today we’re seeing promising signs of continuing retail market expansion. Importantly, part of the California bill ordered the public utility commission to consider development plans for full retail competition by 2020. “That’s really encouraging. That’s a big market that we’re pretty excited about the potential of,” Schultz notes. Another state looking into expansion is Nevada, where a referendum was recently passed once, but needed a second affirmative vote to become a state law. The second vote came up short in the midterm election, leaving the Nevada energy market at status quo for now. Finally, Virginia recently passed an order that is a big win for business energy buyers. Organizations can now aggregate up to five megawatts of their load to purchase renewable energy from a non-utility supplier withoutbeing subject to the five-year ban on utility service. Before it was passed, the order was met with strong opposition that took it to the highest court in the state. Direct Energy pursued clarity around these shopping rules on behalf of current and prospective customers, and helped to drive the pro-market interpretation that the court upheld. Learn about energy solutions for your commercial and industrial operation online, or call 855-399-9741 to get a customized quote. Virginia regulators on Thursday refused to let Walmart leave its incumbent utility service in the state to shop for electricity on the open market, writing it would raise costs too much for residential ratepayers who cannot choose their power supplier.Walmart’s exit from the services of Dominion Energy and Appalachian Power would cost residential ratepayers nearly $70 million over 10 years, the State Corporation Commission (SCC) said. That “cost shifting” is not “consistent with the public interest,” they wrote. Regulators said a recent energy law — S.B. 966 — also encouraged cost shifting from business to residential customers. The SCC has pending exit applications from Target, Costco, Harris Teeter, Kroger, Cox Communications and mining company Contura Energy, The Virginian Pilot reported Monday. In cases of load aggregation, the SCC must determine if the rest of a utility’s ratepayers would be harmed by the commercial customer’s exit from utility service. In this case, regulators estimated Dominion customers would pay an additional $65 million over 10 years to make up for the lost demand, and Appalachian Power customers would pay an additional $4 million. “[G]ranting the Petitions is estimated to increase residential customers’ monthly bills by $0.05 and $0.13 for Appalachian and Dominion, respectively,” regulators wrote. In their decision, regulators said the Walmart request came in the context of dramatically higher residential rates in the last decade. Since the state eliminated retail choice for most customers in 2007, “residential customers of Appalachian and Dominion had seen monthly bill increases of approximately $48 (a 73% increase) and $26 (a 29% increase), respectively,” they wrote. Senate Bill 966, a broad clean energy law, is also set to put upward pressure on residential rates, regulators wrote. Passed last year, the bill directs utilities to spend more on renewable energy, efficiency upgrades and grid modernization. It also includes a 2% rate cut for commercial and industrial customers that utilities can recover from their residential ratepayers. The SCC previously approved a retail shopping request from metal company Reynolds Group Holdings, but said that case had no bearing on future decisions. “In that case, the Commission emphasized ‘that the result of this initial review is strictly limited to the instant case and does not establish specific rules for, or the eventual scope of, [aggregated retail choice],'” they wrote. !. If goal of the green bank is to accelerate energy efficiency improvements and the deployment of clean energy technology by leveraging private investment, removing upfront costs, and increasing the efficiency of public dollars. Then when will the residential Property Assessed Clean Energy (PACE) be implemented forDC low and moderate home owners in DC that meet the 80% AMI and qualify for the Solar For All, but do not have the money to come out of pocket to repair their roofs? 2. Looking at the Green Bank Report prepared by the Coalition for Green Capital which indicated that the District need to be capitalized with 105 million dollars The study identified $1.8 billion dollars of investment necessary to achieve the goals of the District’s Clean Energy DC Plan, but on October 9. 2018 former chair of the Public Service Commission Betty Ann Kane testimony indicate that The Sustainable Energy Trust Fund was going to collect 256.6 million a 151.6 million that the needed. So my question to you is out of the 13 million DCSEU has received from DOEE for the Solar For All Program how much money is budget for roof repair and electrical work for low and moderate income residents in wards 8,7,6, and 5? 3.What’s happening now? Has anyone indicated how much money that has been budgeted for community engagement with black owned media in DC? Appoint the seven voting members of the Green Bank’s governing Board for the Council to confirm — by April 2019. Continue reaching out to financial and clean energy experts and community leaders to inform the Green Bank’s design and portfolio of projects — throughout 2019. Hire an Executive Director and other key staff — by Summer 2019. Establish accountability structures, performance targets, financing tools, and clean energy programs for the Board to approve — by Fall 2019. If the composition of the Green Bank’s governing Board, and the portfolio of financing tools and programs the Green Bank ultimately offers, will determine whether it truly becomes a facilitator of clean energy for all. How do you fill about 35 cents out of each dollar collected from district electric and gas rate prayers must be deposited in a African American Owned Bank and in operation in the District of Columbia and that bank would serve as the residential PACE bank of Washington DC? What type of workforce development programs had DCSEU developed? How much funding has DOEE provided DCSEU for workforce development training? 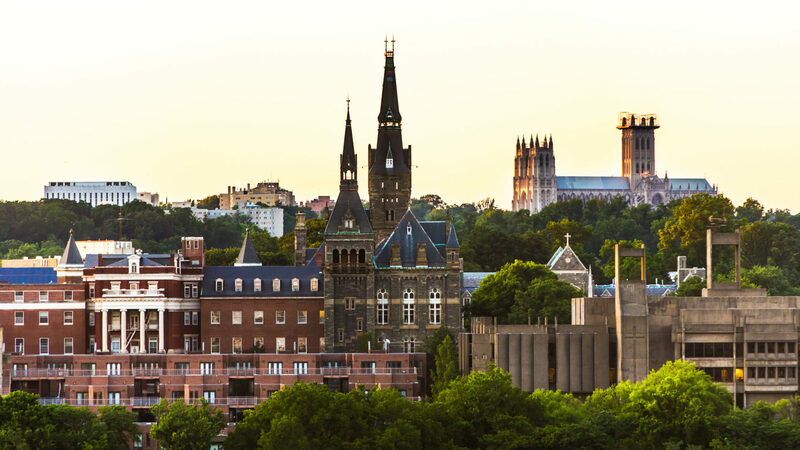 What role will DCSEU play in training with the new Technical High School located in Southeast Washington DC. Please explain the points systems that DCSEU has developed that seems to favor solar development company not based in DC according some of the local companies? At the start of 2019, the Green New Deal has captured the imaginations — and the anxieties — of the U.S. power sector. Pushed by progressive activists and policymakers, the GND is a set of environmental policy proposals that aim to decarbonize the U.S. power sector within a decade and move the economy to net zero carbon emissions by mid-century. The movement, outlined in a nonbinding Congressional resolution this month, also includes broader policy goals, including federal work programs and universal health care. Activists say those are crucial to remake the economy into one that is more just and sustainable. Less than a year old, the movement is influencing state policy plans and the 2020 presidential race. But the wide range of proposals has also raised concerns in the power sector — particularly the movement’s position toward nuclear power and other non-renewable resources. The rollout of the Congressional resolution, for instance, was complicated when the office of Rep. Alexandria Ocasio-Cortez, D-N.Y., circulated a fact sheet — later withdrawn — that contemplated shutting down nuclear plants. An earlier letter to lawmakers from Friends of the Earth and a coalition of other environmental groups advocated limiting the movement’s scope to non-hydro renewables. Those conversations in the movement continue, said Greg Carlock, the Green New Deal research director for Data for Progress, a left-of-center research group. But increasingly, GND activists realize that existing nuclear plants and other non-renewable technologies may be necessary to push the scale of carbon reductions they desire. Last September, Carlock wrote a Green New Deal report for Data for Progress that has come to be seen as one of the foundational texts of the movement. In a wide-ranging interview he addressed the GND’s broader policy goals and how market-based policies can factor into the implementation of deep decarbonization goals. There has been a change in the name of this podcast. What was previously The Electric Power Show is now The Electric Power Station. We made this change for copyright reasons, but when we thought about it, Electric Power Station is a better name for the program, given its allusion to a substation or power generating station. Wind and solar power projects are under attack by coal and gas companies that fear competition from the booming renewable energy industry. Below are examples from the past year of the fossil fuel industry’s war on renewable energy projects. Who killed the Wind Catcher project? In July of 2018, AEP announced the cancellation of the Wind Catcher project, a multi-state effort to build what would have been the nation’s largest wind farm. The move came after the Public Utility Commission of Texas (PUCT) denied approval of the project, which had been previously approved by regulators in Arkansas and Louisiana, as well as by the Federal Energy Regulatory Commission. A list of United States Steel subsidiaries and joint ventures found in the company’s most recent annual report includes Chisolm Coal LLC, Kanawha Coal LLC, Ontario Coal Company, and Stelco Coal Company. TIEC was represented in the Wind Catcher case by the law firm Thompson & Knight. “We are counselors to Texas Industrial Energy Consumers (TIEC), a trade association representing approximately 50 of the largest energy consumers in the state,” according to the firm’s website. “Many TIEC companies are leaders in oil and gas production and refining, and in all forms of manufacturing, including high-tech, pulp and paper, and virtually every type of chemical manufacturing,” Thompson & Knight’s website also says. Other TIEC members identified in a filing in a separate case last year included the Chevron Phillips Chemical Company, ExxonMobil Power & Gas Services, Kinder Morgan, Phillips 66, and Valero Energy. The PUCT’s order in the Wind Catcher case noted that while AEP projected nearly $1.5 billion in net benefits for consumers over the life of the project, opponents found the project would result in net costs. TIEC “argued the net cost could exceed $1 billion,” according to the PUCT order. “The bulk of the evidence in this proceeding casts doubt on the assumptions SWEPCO [an AEP subsidiary], who bears the burden of proof, used to determine that benefits to consumers are probable,” the PUCT said, and much of that “evidence” came from TIEC. The PUCT’s order cited the arguments of TIEC more than those of any other intervenor in the case. It was preceded by a “Proposal for Decision” by an administrative law judge that mentioned “TIEC” 135 times. One of TIEC’s arguments was that AEP overestimated the value of Wind Catcher’s carbon emissions benefits by $550 million, and that those benefits should be negated due to President Trump’s efforts to roll back the Clean Power Plan and the unlikelihood of a carbon tax being imposed anytime soon. The PUC and administrative law judge both echoed TIEC’s arguments on this issue. Ironically, AEP opposes a carbon tax and the utility has also backed special interest groups, such as the American Coalition for Clean Coal Electricity and Utility Air Regulatory Group, involved in fighting the Clean Power Plan, the Obama-era EPA rule that sought to set limits on carbon pollution from power plants. The fossil fuel industry opposed Wind Catcher in other states too, including opposition in Oklahoma from the Windfall Coalition, backed by the gas producer Harold Hamm and other fossil fuel funded forces. 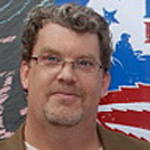 Americans for Prosperity (AFP) fought the project in in Arkansas, Louisiana and Oklahoma. The group is backed by the Koch brothers, and has also had financial ties to coal producers like Alpha Natural Resources and, in Oklahoma, Peabody Energy. AFP included the death of the Wind Catcher project on a list of its victories in 2018. Anti-Wind Catcher campaigns were also run by dark money groups that used names like “Protect Our Pocketbooks,” “Renewable Arkansas” and “Renewable Louisiana.” Protect Our Pocketbooks employed lobbyists in Arkansas and Louisiana known for their work for the gas industry. As previously reported by the Energy and Policy Institute, Americans for Affordable Energy, the group behind Renewable Arkansas and Renewable Louisiana, was incorporated in North Carolina by the fiancee of the director of research for the Hawthorn Group. The Hawthorn Group is known for its role in deceptive political campaigns backed by fossil fuel and utility interests. Coal producer Murray Energy secretly paid for an attorney and consultant to represent two local residents in their fight against the Icebreaker pilot offshore wind power project on Lake Erie before the Ohio Power Siting Board (OPSB). The same lawyer and consultant that Murray Energy paid to fight Icebreaker are now employed by the Ohio Coal Association in its battle against AEP’s plan to invest in 900 megawatts of new wind and solar power before the Public Utilities Commission of Ohio. The attorney, John F. Stock of Benesch, Friedlander, Coplan, and Aronoff, previously represented a shadowy coal-backed group called the Campaign for American Affordable and Reliable Energy (CAARE) in a number of wind power cases before the OPSB. CAARE’s requests to formally intervene in several of those cases were denied, and since then Stock has been representing a growing number of anti-wind activists in Ohio and Michigan. Stock is currently representing anti-wind activists in fights against the Seneca, Republic, Black Fork, and Buckeye/Champaign wind farms in Ohio. He’s also popped up in the docket for the Firelands Wind project, where he is not publicly representing anyone yet. Stock did not respond to an earlier request for comment from the Energy & Policy Institute on who is paying is for his work on the Seneca and Republican wind farm cases. Stock also has requested to intervene in a lawsuit challenging Ohio’s restrictive wind turbine setbacks, which have effectively halted new wind farm development in the state since 2014, on behalf of anti-wind activists in Seneca County who support the current setbacks. The Mid-Atlantic Renewable Energy Coalition and local residents who filed the lawsuit challenging the setbacks as unconstitutional under Ohio law are fighting Stock’s efforts to intervene in the case. “… if the Seneca Residents are permitted to intervene through the same counsel that represents coal industry interests, systematically attempts to intervene in wind-energy matters, and regularly appeals pro-wind decisions, this straight-forward declaratory judgment action will become protracted litigation unnecessarily,” they said in a court filing. “… the identity of other clients that the Affected Residents’ counsel represent in separate, unconnected litigation is utterly irrelevant to whether the Affected Residents are entitled to intervene in this action,” Stock said in a response to their challenge. Elsewhere, the coal-producer Alliance Resource Partners is fighting a proposal by the utility Vectren to build a 50 megawatt solar farm in Indiana. The Institute for Energy Research (IER), a group that has received funding from the Koch brothers and coal industry, has continued its campaign against offshore wind power, a campaign that dates back to the fight over the Cape Wind project. In 2018, IER opposed federal funding for the Icebreaker project and attacked plans to develop wind turbines off the coast of Maryland. IER regularly promotes the views of top anti-wind activists like John Droz of the Alliance for Wise Energy Decisions, Lisa Linowes of the Industrial Wind Action Group, and Sherri Lange of the North American Platform Against Wind on its blog, MasterResource.org. 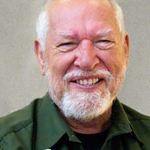 Robert Bradley, the CEO and founder of IER, personally defended prominent anti-winders like Kevon Martis of the Interstate Informed Citizens Coalition and the Ohio-based consultant Tom Stacy last year, after their ties to fossil fuel industry front groups were exposed by clean energy advocates. Lisa Linowes also joined the Texas Public Policy Foundation (TPPF) as a senior fellow in 2018. TPPF is behind what the Texas Observer dubbed an “anti-wind crusade” in the Lone Star State. The group received nearly $2 million from the Charles Koch Foundation in 2017 alone. Other groups involved in attacks on wind power projects include the Manhattan Institute in New York, a think tank backed by ExxonMobil and the Koch brothers. The Caesar Rodney Institute, which has received funding from dark money portals tied to the Kochs, was behind a website – saveourbeachview.com – and banner airplane ads opposing offshore wind in Delaware and Maryland. The Koch-backed John Locke Foundation continued to claim that the Amazon Wind Farm interferes with military operations in North Carolina on its website CarolinaJournal.com. Many of the fossil fuel interests involved in attacks on wind power have disclosed the financial risks of competition from renewable energy. “Fuel conservation measures, climate change initiatives, governmental requirements for renewable energy resources, increasing consumer demand for alternative forms of energy, and technological advances in fuel economy and energy generation devices could reduce demand for the crude oil and natural gas we produce,” Continental Resources, the oil and gas company helmed by Harold Hamm, said in its most recent annual report to investors. “Alliance has served as a coal supplier to Vectren,” Alliance Resource Partners said in its petition to intervene in the Indiana Utility Regulatory Commission (IURC) case where it’s fighting Vectren’s solar project. If the IURC allows the solar project to proceed, it will impact Alliance’s “prospects for providing future coal supply to Vectren,” the coal producer said. “OCA’s active members supply coal to AEP and other Ohio electric generators to fuel their coal-fired generation plants,” the Ohio Coal Association said in its motion to intervene against AEP’s wind and solar power proposal. “OCA and its members, therefore, have a direct interest in ensuring that low-cost, reliable coal-fired generation is not squeezed out of a competitive market by high cost and highly-subsidized renewable generation sources,” the Ohio Coal Association said. The Ohio Coal Association and members like Murray Energy have backed the Trump administration’s efforts to bail out uncompetitive coal and nuclear power plants. Analysts on both sides of the debate on that issue have found the latest iteration of Trump’s bailout plan could cost consumers billions of dollars. The Supreme Court on Tuesday announced it will hear a broad case on the Clean Water Act that could have major implications for utility infrastructure, particularly coal ash disposal facilities. The case, County of Maui, Hawaii v. Hawaii Wildlife Fund, concerns whether the CWA applies to pollution that seeps through groundwater before entering navigable waterways subject to the law. It focuses on a wastewater treatment facility in Hawaii, but lower courts have also provided split decisions on how the CWA applies to such pollution from coal ash facilities. Last year, federal circuit courts ruled that pollution from ash facilities owned by the Tennessee Valley Authority and Dominion Energy did not violate the CWA because they were not point sources of pollution. In the Tennessee case, the court said the proper avenue to address the pollution is the Resource Conservation and Recovery Act (RCRA) — another federal law facing litigation. Though the Supreme Court case focuses on discharges from a wastewater treatment plant on Maui, the eventual ruling could have broad impacts on permitting for a variety of energy projects that can release diffuse pollution. Arguments in the County of Maui case reflect similar issues at stake in the coal ash cases. The county argues that wastewater pumped out of the plant does not violate the CWA because it travels through groundwater — not subject to the federal law — before it reaches the Pacific Ocean. The Hawaii Wildlife Fund says the law still applies. The EPA weighed in on the side of the environmental group during the Obama administration, arguing the CWA has long applied to groundwater if there is a direct hydrological link to a navigable waterway. But the Trump administration is now reviewing that finding and could recommend the court reverse the precedent. How the court decides could influence billion-dollar disposal decisions for coal ash facilities across the U.S. When TVA lost a lower court decision regarding coal ash at its Gallatin plant in 2017, it estimated the cost of moving the waste to a lined landfill at $2 billion. TVA won a temporary reprieve last year from the U.S. Court of Appeals for the 6th Circuit when it reversed that decision, holding that “migration of pollutants through groundwater” is excluded from the CWA. A similar situation played out at Dominion’s Chesapeake Energy Center, where the 4th Circuit Court of Appeals last year struck down a lower court ruling that arsenic pollution from ash facilities at the plant violated the CWA. Instead of the CWA, the courts in both cases said this type of groundwater pollution falls within the regulatory scope of RCRA. That law is the foundation of the nation’s first federal regulations on coal ash, finalized during the Obama administration, but it is also the subject of legal uncertainty. Last July, the Environmental Protection Agency announced it would roll back the rule following a court challenge from utility companies, giving states the authority to set disposal standards. But then, in a different case decided in August, the D.C. Circuit Court ruled that the original, Obama-era rule was not protective enough. Environmental groups in October filed a petition with the U.S. Court of Appeals for the District of Columbia Circuit, arguing it should vacate the offending parts of the EPA coal ash rule and force utilities to take cleanup actions immediately. EPA filed a response in late January, arguing that throwing out the rule could “compromise the reliability of the electric grid,” and asking the court to allow utilities to continue compliance efforts for its weakened rule. On February 26th 27th and 28th, 2019 the American Association of Blacks in Energy (AABE) will host its first Capitol Hill Day and Energy Policy Summit at the National Press Club in Washington, DC. The Summit is a biennial event that brings together legislators, policymakers, energy industry leaders, and Black and Brown community stakeholders. The objectives of this gathering are to provide a platform for discussion on current and emerging energy policies and to advocate for equitable outcomes for communities of color. The Energy Policy Summit is the brainchild of David Owens, the former Chairman of the Legislative Issues and Public Policy (LIPP) Committee on the AABE Board, and a former Sr. Vice President at the Edison Electric Institute (EEI). Owens realized that there needed to be a forum at the Federal level for the deliberation of energy policy with a focus on impacts on under served communities. These communities tend to be overwhelmingly Black and Brown. Leaders from the US Dept. of Energy have consistently framed the context for the summit by discussing the state of America’s energy security, and the administration’s energy policy objectives. With an increasingly changing energy landscape, the Federal Energy Regulatory Commission (FERC) over the next several years will confront issues impacting LNG export expansion, generation capacity, advancements in storage technology, and transmission security. This session will examine the FERC’s priorities; review key decisions over the previous two years; and identify potential critical junctures for regulated entities. With states and cities passing aggressive carbon emission goals— energy producers, generators, providers, consumers, and others, are under increased requirements to adopt low-to-zero emission fuel sources. Hear industry experts discuss the application of policy at the operations level, including how policies impact consumer energy costs, energy efficiency, and issues of climate change. In 2018, the Administration proffered a strategy to protect the nation’s diverse energy resources as an issue of national security. Representatives from leading energy trade associations will discuss the proposal, impacts on climate change, and the future of energy production, generation, and use. Industry and policy experts discuss the mechanics of developing the nation’s transportation future, covering vehicle manufacturing, infrastructure development, equitable access, and the role of federal policymakers. Enacted in 1978 to encourage competitive generation and energy diversification, PURPA has been an effective tool in developing renewable markets. However, many see the law as outdated and counterintuitive to today’s markets and consumer benefit, requiring long-term contracts impacting costs. Proponents of change additionally argue the one-mile rule, important to small generation incentives, allows for significant abuse. Hear policy and industry experts discuss PURPA’s purpose, practical impacts, and the future of PURPA in the 116th Congress and beyond. Residential “EE” receives relatively little attention compared to major projects like the retrofit of the Empire State Building in New York City. While it seems like a small thing to make one home energy-efficient, the aggregated potential for energy savings in homes is enormous. In fact, household energy use represents almost 25 percent of total energy consumption in the United States, according to the American Council on Energy Efficiency. Single family homes account for about 80 percent of residential energy consumption, 15 percent is used in multi-family homes, and five percent in mobile homes. If we could fully deploy conventional energy efficiency in the residential sector, according to McKinsey and Company, we could achieve a 28 percent cut in annual energy consumption in the residential sector, thereby saving consumers $2.2 billion on their energy bills. That is a win all around, for American households as well as for job creation and the environmental impact of reducing carbon emissions and other pollution. So what are the barriers that prevent this from happening? Discovering direct and indirect connections between energy and trade—Is the energy industry insulated from international trade conflicts? An Act to Promote 21st Century Energy and Manufacturing Workforce, authored by Rep. Bobby L. Rush, Chairman, Subcommittee on Energy and Power, House Energy & Commerce Committee, “directs the Secretary to prioritize education and training for energy and manufacturing-related jobs in order to increase the number of skilled workers trained to work in energy and manufacturing-related fields when considering awards for existing grant programs.” This discussion will detail developments to date and next steps. The federal electric vehicle tax credit was established with one goal: Grow the nascent EV market. While we have seen considerable expansion, we are not close to a fully mature market and the benefits that come with it. To ensure the continued growth and eventual stabilization of the market, the electric vehicle tax credit must be reformed. The polar vortex is in full swing and drivers everywhere are finding out their cars don’t love the frigid temperatures. All cars, both gas and electric, use more energy in cold weather, which yields reduced gas mileage and shorter EV range. For most EV drivers, this isn’t necessarily a big deal, especially if your electric range is more than twice your daily commute. Nonetheless, this extreme weather has brought with it some unique hurdles for EV owners. Fortunately, there are some easy steps you can take to mitigate these challenges. Here are some tips for EV drivers to help handle cold weather. If you have an enclosed garage at home where you can charge your EV, definitely do so. By charging your car indoors, you can prevent ice build up on the vehicle and keep the battery warmer. EV batteries are like humans—they are most comfortable at 70 degrees and a warmer battery will garner more driving miles. You can do one better by preconditioning the cabin before you begin your trip. Most EVs allow you to schedule this in advance and it has two benefits. One, you get to climb into a warm car on a cold day! No waiting for the heater to warm up or the seat heaters to kick in. Two, your battery warms up to its optimal operating temperature. You get to drive farther more comfortably—what’s not to love? By preconditioning while plugged in at home, you’ll leave for work 100% charged with a warm pack and cabin. If you aren’t able to precondition your cabin, try to use the seat warmers over the cabin heat if range is an issue. The seat warmers generally use less energy than the cabin heater and can be felt immediately. Of course, Murphy’s Law can strike at any time. In order to prevent a serious emergency, there are a few basic steps you can take to ensure a safe trip. Make sure your vehicle has its standard level-one charging cord on board in case you need to stop for an emergency charge. This is one area where EVs have a clear advantage; you can recharge your car from any standard wall outlet in a pinch. And be sure to carry warm clothing, a bit of food, and a phone in case your car becomes immobilized–just as you should in a gas car during extreme weather. Lastly, reducing your speed in hazardous driving conditions not only makes for safer driving, it also increases your EV’s range. In addition, EVs have the benefit of being able to carefully control torque from a standing start, compared to gas cars that have zero torque at zero RPM and have to be revved up to start moving. With slick, icy roads, it’s much easier to avoid spinning out from a standing start in an EV and easier to slowly climb a hill. If you try going slowly up a hill in a gas car, you’re likely to stall the engine. Unfortunately, gas car owners can’t refuel their vehicles from the comfort of their garages. With the cold weather sapping their gas mileage, they’ll have to make more frequent visits to the gas station in the frigid cold. Gas cars also run into the issues of both the thickening of oil and ice in the fuel line, either of which can be complete show stoppers. Below -20 degrees, oil is too thick for the oil pump to effectively circulate; likewise, any moisture present in the fuel lines or fuel tank can freeze, blocking the line and clogging the fuel pickup. The freezing cold can also cause the 12-volt lead acid battery to fail, requiring the vehicle to be jump started. The only way to avoid these issues is to get an EV. OUR HISTORY: Over 58 Years of Business Excellence Stephen “Steve” Hightower founded Hightowers Petroleum Co. in 1984, continuing a family legacy of entrepreneurism that began in 1957 with the establishment of the family’s cornerstone business. From those humble beginnings and through persistence, drive and determination, Steve methodically began to grow his wholesale fuel distribution business into an energy solutions enterprise that today is recognized throughout North America for its customer service, integrity, creative fuel distribution model and expert handling of complex upstream and downstream issues. No matter your industry or fleet size, increasing efficiency and productivity are universal priorities. Busy fleet managers, over-the-road (OTR) truck drivers and members of your sales team have enough responsibilities without having to devote extra time to routine fleet-related administrative tasks. We capture Level-3 transactional data which provides the highest level of transaction analysis and detail available. Hightowers Petroleum Co. offers two benefits-loaded retail card solutions that can be customized to suit your specific company’s fueling needs. Fleet managers will appreciate the wide range of useful transaction and tracking features, while drivers will welcome the simplicity associated with not having to submit paper receipts and detailed expense reports for reimbursement. Save money on fuel management expenses, establish a never-fail fueling policy, gain tighter control of spending, and enjoy a rebate (high volume users) with our WEX card program. Eliminate “red tape,” endless piles of receipts and reduce administrative costs with our smart fleet and procurement Card solutions… guaranteed to simplify your fleet’s management and life. Here are just a few recognitions Hightowers Petroleum Co. has received. April 17, 2015 – Cincinnati Business Courier – The Cincinnati USA Regional Chamber’s Minority Business Accelerator announced in March that four of it’s member companies have earned the designation of “Accelerator Emeritus,” and Hightowers Petroleum Co. was among them. April 14, 2015 – Ernst & Young Entrepreneur of the Year. Steve Hightower has been chosen as a finalist. December 9, 2014 – Ohio Minority Supplier Development Council (OMSDC) held its annual Awards Gala, HPC received Supplier of the Year, Class IV.